Discover cultural tours in Western Europe in August 2019, visiting places like Rome and Florence. Book now and save with TourRadar.com! "This was the best trip I've ever taken! 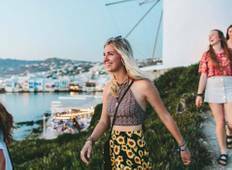 I've done contiki and topdeck and I loved..."
"Jacqui is the best tour manager ever! I am so impressed with her knowledge of Greece..."
"It was a 13 day tour. Our tour Director, Franco, was wonderful, as was our driver,..."
"Loved our guide, she kept us focused and moving. We saw so much and when given our..."
"The Simply Italy trip was amazing. Beyond my expectations. Maite, our tour guide,..."
"Our guide, Letizia, was awesome! We wanted to see as much of Italy, as we could,..."
"Overall extremely pleased with the professional staff, both Celia the Tour Director..."